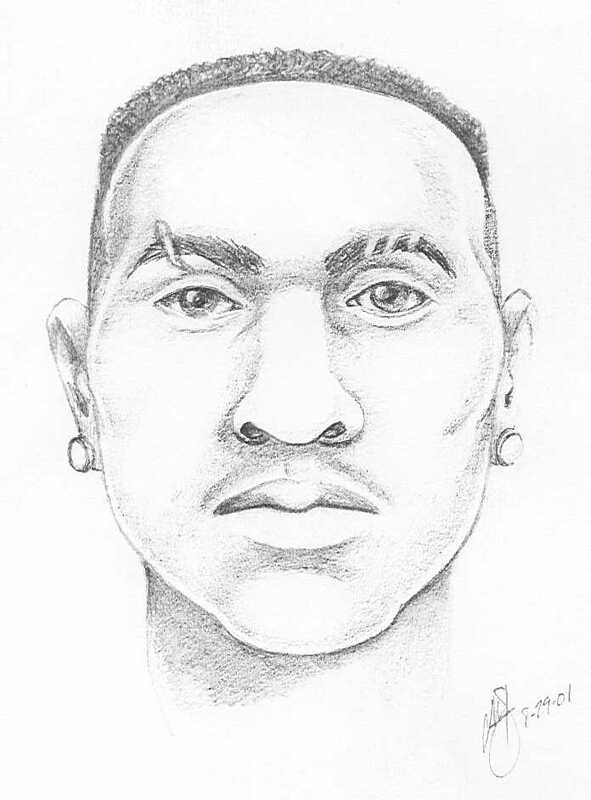 (October 3, 2001) LBPD has released this composite sketch of a murder suspect in the killing of 17 year old Esmeralda Alvarez, and the wounding of her 15 year old sister and another 17 year old, in the area of 9th and Elm on December 28, 2000. The suspect is described as a male Black, approximately 18 years old, 5'10", thin build, and is believed to have a pronounced vertical scar across his right eyebrow. Police say the three victims were talking in front of an apartment building in the 300 block of East 9th St. (near Elm) at about 10 p.m. when a suspect approached, made a statement regarding a gang and then opened fire with a handgun. Police did not suggest any of the victims were involved with a gang. Anyone with information regarding this crime is urged to contact LBPD Homicide Detectives Richard Conant and Robert Erickson at (562) 570-7244.